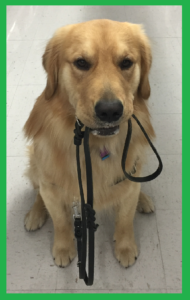 Listen as Jessa Parker explains our Service Dog Program! 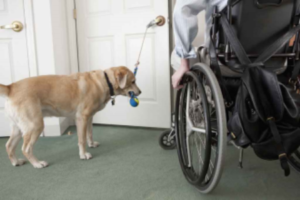 AZ Dog Sports (AZDS) is excited to offer a new, affordable program geared at making a mobility service dog or diabetic alert dog a reality for people across the Valley. Service dogs can learn tasks like retrieving dropped items, helping open and close doors and cabinets, turning lights on and off, and many other tasks that can aid a person in greater autonomy and better quality of life. Most Service Dog programs have long waiting lists, and very large price tags, and rely on a mature dog being able to bond with a stranger. Our program will be timely, affordable, and build on the existing bond between you and your dog. Our Academy consists of two potential training levels. After the prospect dog is evaluated by an AZDS trainer, they can enter the first level of training with a goal of training the dog to become a Canine Good Citizen, therapy dog, or Home Helpmate. These dogs will have learned important obedience and body awareness skills for living with their guardian or family member with a mobility impairment. Dogs who complete level one will be able to assist their handler with daily tasks around the home. Approximately 18 hours of lessons with an hour evaluation by your trainers after completion. Dogs must be able to earn a CGC level of certification or comparable to continue. Our trainers will test your dog. This first level can take anywhere from 3 to 4 months, while the dog learns and matures. Some dogs may attain this level in less time. Each team will be provided with a high quality lifetime handmade leather 8-way lead, a treat pouch, treats, a clicker, and a place mat for beginning training. 6 hours of Puppy obedience training or Level 1 Obedience/ “Polite Canine” for dogs 6 months plus. 6 hours of Level 2 obedience or Canine Good Citizen. 6 hours of “Intro to Service Dogs”. 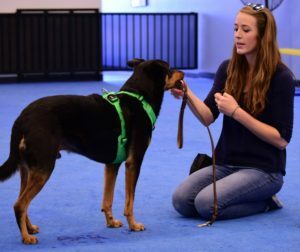 Intermediate classes will include, Helpful Canine, Scentwork and Beginning Public Access. 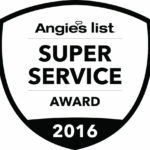 Advanced classes include Working Canine, Intermediate and Advanced public access, Service Dog level 2 and 3 and Platinum privates. 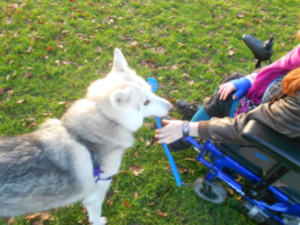 This level of study is customized to each client’s mobility needs and can last anywhere from 2 to 8 months, depending on the requirements of the individual guardian and the dog's level of maturity and ability to work on the desired tasks. AZ Dog Sports service dog trainer comes to work with each person and dog team in their home environment weekly to work on customized lessons in home and in the dog’s own environment. Training four times per week, with our professional staff; while the dog remains housed in their own home. 2 hours of small group classes per week with a professional head trainer / and an apprentice trainer. 1 hour in-home private training skills session. 1 hour public access training session. Here our trainer teaches the basic applications of public access, sociability, and team skills a dog is required to possess to pass this high standard for access to all public locations. Dog will be required to wear appropriate service dog designations and approved "in-training" service dog apparel per Arizona Dog Sports Policy, not required under A.D.A law.